Family and Kids Karate Class - Try It Now! Our Family and Kids Karate class is extremely popular. In this class the Parent and Child are learning together, bonding, growing and achieving excellence all at the same time. The results the children are producing in our unique family class are amazing. This is a great way to save time while enjoying this wonderful experience with your family. We can see that the kids are flourishing in the acquisition of skills. The bonds that are formed from this super experience are largely due to the support given to each kid by the child's mother or father's participation. Kids four, five and six learn so much faster when they have their parent in the class supporting their work and comprehension. The father and son time is amazing. The mother and daughter time is great too. Of course mom and son or dad and daughter are just as welcome in the programme. Now is your chance to enjoy this very special time with you child. Email us and I will send you an invitation to try out this class for yourself and see the benefits in action. Here you see a dad giving support to his child. 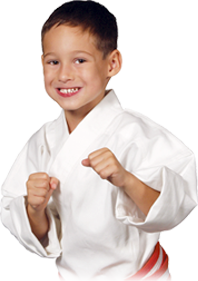 Visit our video and photo gallery for more wonderful pictures of kids doing Karate. Click Here for the Family and Kids Class Web Page. Everyday children are faced with difficult decisions that will impact on their self esteem and self confidence. Each and every child responds differently according to his or her background and knowledge in their time of need. Children will draw from their past experiences when they are forced to deal with a difficult situation. It is our responsibility to make sure their safety is our utmost concern. This is your chance to give you child the education they need to feel good about themselves. Our programme is designed to empower your child with more esteem and self reliance. At the MMA and Karate College for Kids we do everything we can to prepare a child to be able to meet the challenges they face at school or anywhere else in their lives. We take pride in making it our mission to make sure every child has a healthy sense of self esteem and good self image that can only be achieved through education and training. In our classes we provide a safe environment for your child to grow and flourish in today's times. Our goal is to prepare your children for the real world and real life situations. We teach children how to deal with a variety of self defense scenarios that will make him or her safe. Our students will not be victims. They can truly protect themselves. Please contact us to book a free introductory assessment by sending us an email or contact us by telephone. Kids Karate classes are Sunday through Thursday. We offer a traditional Shotokan system of Karate Classes that are recognized by the Ontario Karate Association. Unlike most Karate schools in Toronto, we have been accepted by Karate Ontario and the National Karate Association as an authentic system of Karate Instruction. Our students learn traditional Kata and Kumite from our Master Instructors Michael Hirchberg and Marianna Yugo who each have over 35 years experience in the Martial Arts. Sensei Hirchberg has International Karate experience both as a competitor and a coach. He has won numerous championships over the years. Sensei Hirchberg has represented Canada at the World Maccabi Games twice. He has sent several of his students to this competition in the Junior and Senior level Games. Sensei Marianna Yugo was a four time European Karate Champion and came number two in World twice in the World Union Karate Federation. There is no one in Canada who was ever ranked this high in Woman's Karate. Our Kids Judo Instruction is offered Sunday through Thursday. All classes are taught by Sensei Hirchberg. Sensei Michael Hirchberg's Judo lineage can be traced back to Wilem Ruska where Sensei Hirchberg's teacher, Sensei Zeev Alony trained for 12 years. Wilhem Ruska is the second non Japanese to win a Gold Medal in the Olympic and World Judo Championships. Not surprising but first to defeat the Japanese was Wilhem Ruska's teacher Anton Geesing. Sensei Hirchberg was Zeev Alony's private student for many years. This one on one training was extremely comprehensive dating back to 1985 when Mr. Aloni first arrived in Canada. Together they worked on a strong ground game which allowed Sensei Hirchberg the ability to transition into MMA with great ease. Sensei Hirchberg is both a Judo and Karate Instructor for children, teens and adults. Sensei Hirchberg was way ahead pack as he started combining arts back in 1985. Sensei Hirchberg recognizes the weakness in single art training and has offered mixed Martial Arts for over 20 years. Kids MMA classes are Sunday through Thursday. We have a variety of different MMA classes for kids that are starting now. MMA Kids classes are offered to allow children to learn both grappling and striking in mixed martial arts safe environment. We stress non contact sparring with full safety gear on hands to protect against any injury. Classes are led by Sensei Michael Hirchberg. You can contact us by telephone at 416-787-3077 to arrange a free trial lesson. Kids BJJ classes are Sunday through Thursday. BJJ is one of the fastest growing sports in the world. We offer an excellent programme that is taught in safe family friendly way. We accept kids four and over into our classes. Come take a free lesson and see how exciting this programme is and what it has to offer. Servicing - Forest Hill, Bedford Park, Rosedale, Armour Heights, Downsview, York Mills, Lawrence Manor, East York, Wilson Heights, York, Bayview Village and the GTA. Please go to http://maps.google.ca/maps to find direction from the following major streets in Toronto: Bathurst Street, Avenue Road, Yonge Street, Spadina Ave. St. Clair, Mount Pleasant Ave. Dufferin Street, Keele Street, Jane Street, Weston Road, Eglinton Avenue, Lawrence Avenue, Wilson Avenue, Sheppard Avenue, Finch Avenue, Steeles Avenue, Faywood Blvd., Wilson Heights Avenue, Allen Road, Highway 401, Highway 400, Black Creek Drive, Glencairn Avenue and Marlee Avenue.